Let’s talk about one of the best aspects of modifying a car: the exhaust and the glorious sounds that come with it. I think we can all agree that as a gearhead, one of the first modifications we are eager to do is a new performance exhaust system. Our reasons for the new exhaust may vary, but I think it’s safe to say we all enjoy the end result. 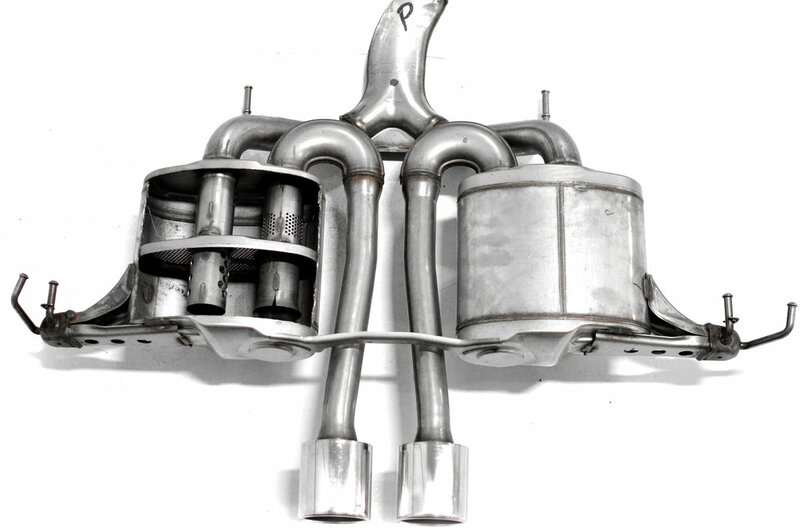 Without further delay let’s take a look at the entire exhaust system from turbo to tip. First let’s look at the OE exhaust system to get a better understanding of Honda’s design goals and constraints. Put yourself in Honda’s shoes for a second and think about manufacturing hundreds of thousands of these downpipes. Suddenly efficiency in manufacturing and cost become high priority, putting peak performance in a distant 3rd. Looking at the OE downpipe in closer detail, you can see there is a lot going on with the design and for good reason. Probably the most obvious is the intricate heat shields covering most of the unit. Heat management is a critical aspect in designing a reliable performance system, so don’t reference those heat shields with a four letter word just yet; more on that later. Next, take those heat shields off and you see that the flow path for the exhaust gases is not a smooth and laminar path. This simply comes down to mass production manufacturing in the most cost effective method. 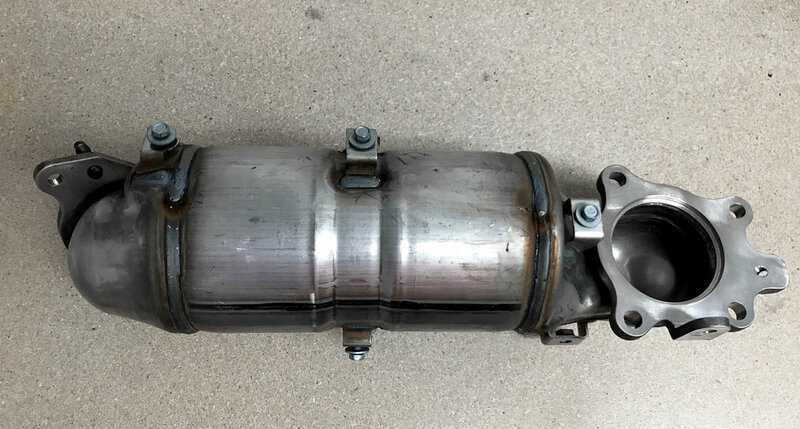 The inlet of the downpipe consists of a cast steel flange with some post-machining that is then welded to a couple stamped steel pieces to create the “bellmouth” of the OE downpipe. This follows suit with the rest of the downpipe. Long story short, this design works fine for OE power levels, but leaves some on the table, and that is great news for you. This section of the exhaust is fairly straight forward: Flange, followed by 50.5mm OD pipe with a flex section, followed by some more pipe and another flange, finally, there is a hanger mount to help hold everything in place. The flex section is a critical component that can’t be missed due to its critical job of creating a flexible joint between the exhaust system and the engine movement. Overall this section is pretty cut and dry, let’s move on. Again this is a pretty straight forward design with a decent-size resonator under the passenger compartment and 50.5mm OD piping all the way back to the axle-back section, which is where it gets more interesting. Also note that the design is all one piece which makes shipping one unit a real PITA. As you can see in the image, the OE exhaust has a few different features to reduce/eliminate noise (and I think we can all agree they did too good of a job at this). The forward chamber has a volume of approximately 108 cubic inches, not counting the volume of the pipes passing through. There are also various size and quantity perforations in the pipes for exhaust gases and sound to pass through. Most importantly, the forward chamber was packed full of fiberglass insulation, making this an “absorption” style element. The rearward chamber was as you see it, no insulation, just the open chamber with the inlet and outlet pipes making this a “diffusion” style element. This chamber has a volume of approximately 143 cubic inches counting the volume inside the pipes. And the dividing wall between the forward and rearward chambers is full of very small perforations. This would suggest that Honda designed the open chamber as a combination of diffused and side-resonate elements with a reentrant pipe. Leaving the muffler chambers, we come back to 50.5mm OD pipe, and finally finish with a pair of center mounted single wall tips with 88mm OD. Aesthetically the OE tips work, but leave a lot to be desired. 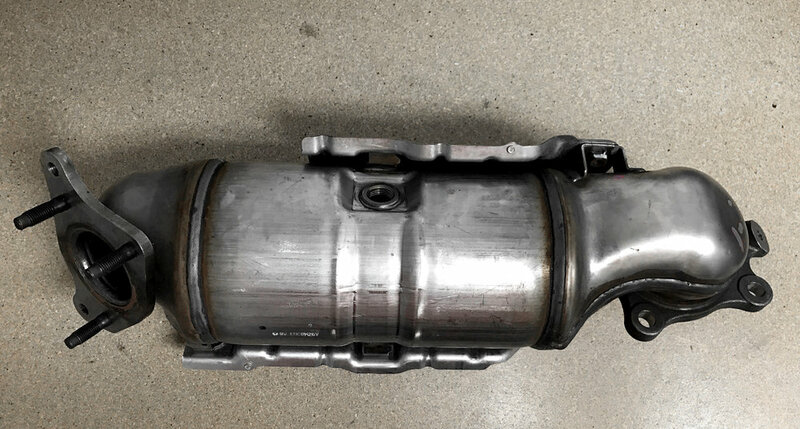 We’ve taken a thorough look at the OE exhaust system in hopes of better understanding how and why Honda designed the exhaust the way they did. Next, we will dive into to 27Won Performance exhaust system, sharing some of our design goals, process and end result.